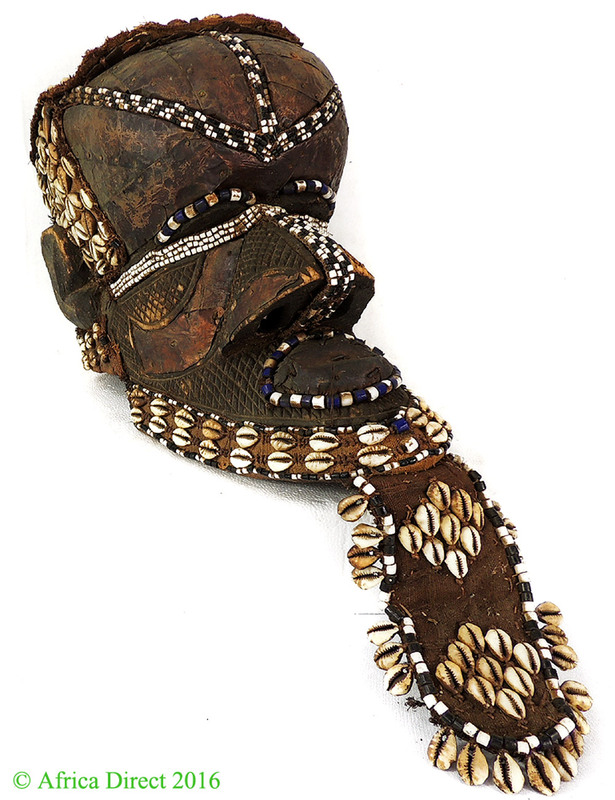 Additional Information: An example of one of the three accepted Kuba "royal" masks, known as M'boom or Bwoom mask. This mask has a bulbous forehead and an underslung jaw with a decorated beard. Copper alloy ornaments the forehead, nose, and the mouth. 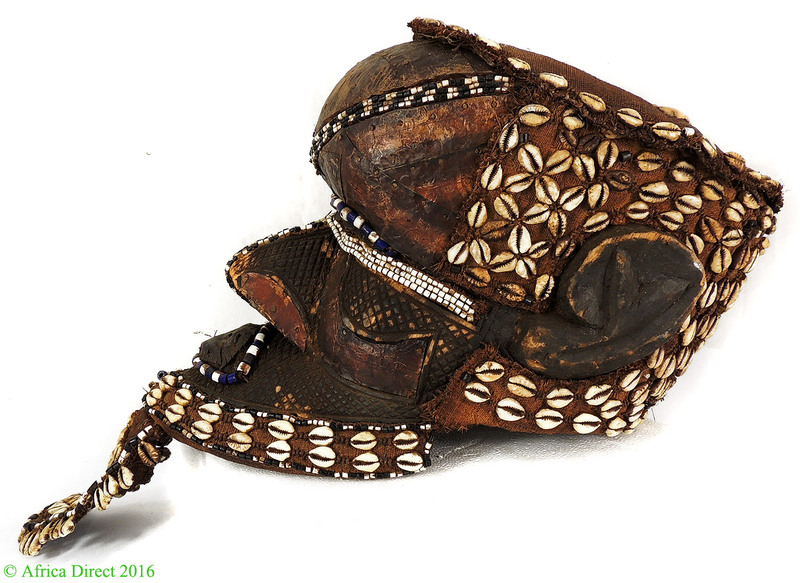 The helmet mask is nicely embroidered with cowrie shells and beads. This mask is well carved and beautifully decorated. It has a lot of presence and its overall condition is very good. In fact, without the bulging forehead which identifies "M'boom" or "Bwoom," the mask would have been difficult to categorize. This is probably due to the diverse stylistic elements found throughout Kuba territory, as the mask has features more commonly found among the Kuba sub-groups. 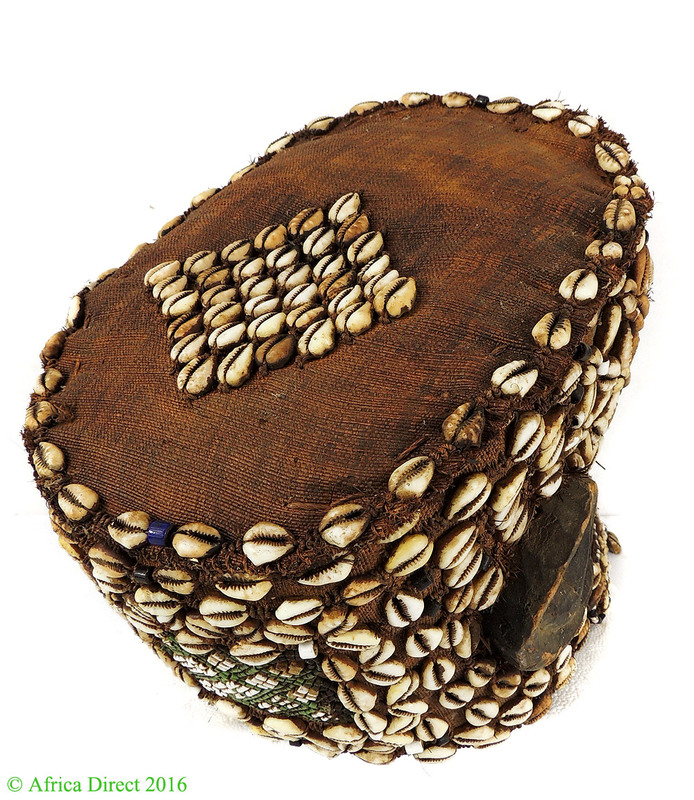 "Bwoom" represents the evil brother in ceremonial reenactments of Kuba mythology, as well as the inevitable struggle for power among individuals. In these dances, Bwoom seeks both the mythical throne of his brother, "Mwaash A Mboy," as well as the king's wife, "Ngaady A Mwaash." Bwoom, a pygmy, symbolically speaks for the common man, with all the temptation and folly that entails. This colorful trio of characters comprises the recognized pantheon of the royal helmet masks, which are eagerly sought-after by collectors and museums. -Meurant, George, 1986, ART KUBA, Credit Communal, Brussels Mack, John, EMILE TORDAY AND ART OF THE CONGO 1900-1909, University of Washington Press, Seattle -Cornet, Joseph, 1982, ART ROYAL KUBA, Edizioni Sipiel, Milano -Cornet, Joseph, 1978, A Survey of Zairian Art-The Bronson Collection, North Carolina Museum of Art.